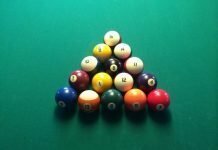 Learn basic bumper pool rules with an overview of how to play this retro billiards game. In 1955 Valley Manufacturing introduced a new game to the world of coin-operated amusements. This game was played on a smaller table with two holes, one on each end of the table. There were eight bumpers placed in a cross-like patter in the middle of the table. You would put a dime in to start a game and each player would get five balls (red or white). The object of the game was to shoot your ball into your opponent’s pocket at the other end. Known simply as bumper pool, tavern owners now had a version of pool for their patrons to enjoy. The new billiards game was hugely popular and ultimately became a staple in the bar and arcade scene. If you grew up in the 70’s or 80’s, you probably played a bit of bumper pool. Over the years, the popularity of bumper pool has declined. In fact, finding a bumper pool table in a bar is rare these days. But it’s still a great bar game. 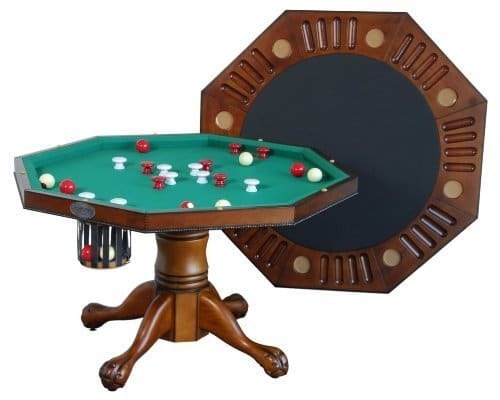 And if you’re looking for a fun version of billiards that fits into a small space, as a homeowner or bar owner, and offers some retro entertainment for your friends and/or patrons, it’s definitely worth revisiting. 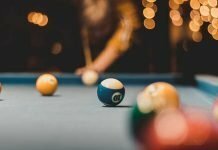 Whether you played bumper pool in your youth and need a refresher, or if you’re completely new to the game and want to try it out, this post will go over the basics of how to play bumper pool. The next step is finding a bar other venue with one of these tables. Of course, you could also purchase one of your very own. Bumper pool is a billiards game. In its simplest form, it is like traditional pool. The game is played on a traditional flat green surface, made from the same material (felt) as the standard pool table. 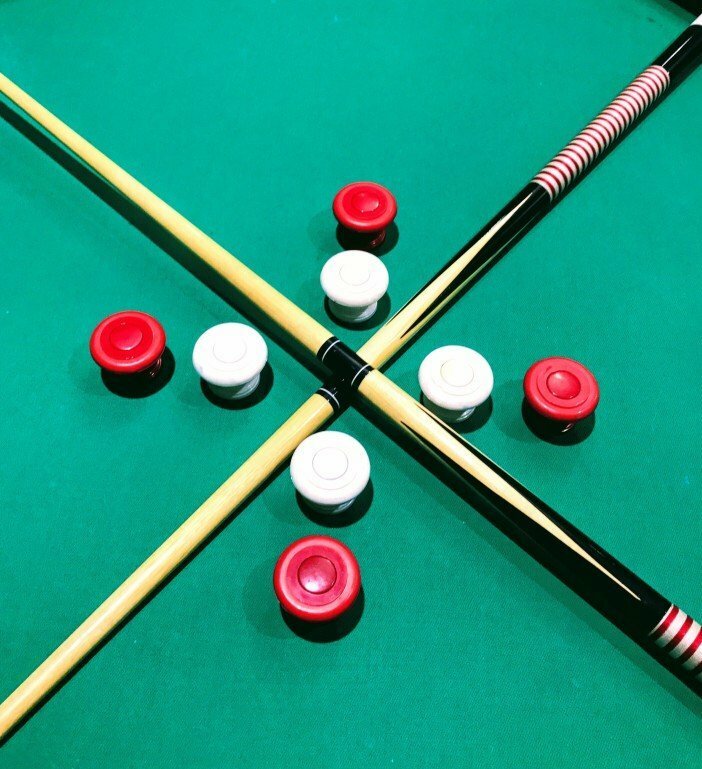 Like traditional pool, bumper pool is played with billiards balls and wooden pool cues. Bumper pool is played on a rectangular or octagonal table that is much smaller than a traditional pool table. Common dimensions for an octagonal table would be 48″W x 48″L x 30″H. An example of a rectangular table would be 41.5″W x 57.5″L x 32H”. Whether playing on a rectangular or octagonal table, the layout and concept is the same. At each end of the table is one pocket. Each pocket has two bumpers that act as goal posts. In the center of the table are two crossing rows of bumpers. Some tables include six bumpers in each row. Smaller tables include four bumpers in each row, for a total of eight bumpers in the middle. The bumpers are usually colored red or white and have a round rubber top that will bounce the ball in various directions. This is the most challenging aspect of the game, and what makes it fun. The object of the game is simple: Be the first to sink all five of your balls in your opponent’s pocket on the other side of the table. There is no cue ball. Before we dive into bumper pool rules, you need to set up the game correctly. 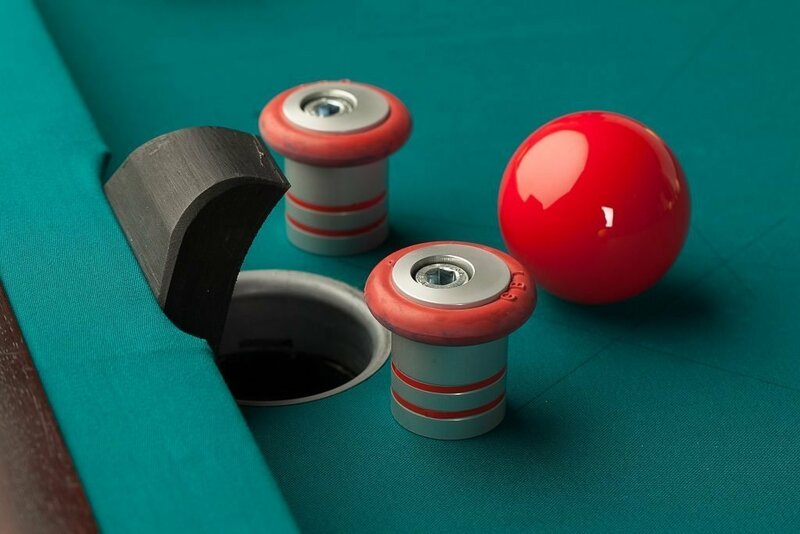 To begin, five balls are placed on both ends of the table surface, five white and five red. At the start of the game, you must place your balls on the white dots that correspond with your pocket. There are two white dots in a horizontal line on each side of your pocket. The 5th dot is directly in front of your pocket. The ball that lies on this dot is specially marked and must be struck first during game-play. This is one of the most important rules of bumper pool. (Bumper pool is a lot of fun. 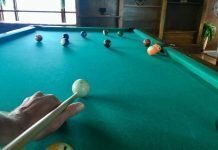 If you want something on a larger scale that’s more challenging, check out the classic game of straight pool, aka 14:1 continuous). The game is pretty simple, but there are some rule to this game. And the rules of bumper pool can be difficult to follow the first time playing. But after a couple trial runs, you should get the hang of it. Bumper pool can be played with two players, or four players as teams. First, decide on a count down and strike your marked balls at the same time to begin the game. You will each shoot your marked ball off the right side cushion. Your goal is to sink the ball in your opponent’s pocket. Or to get as close as possible. If your ball is closest to the cup, it is your turn first. You may then choose to strike any of your other remaining balls. If each player sinks the opening shot, you must once again strike a ball at the same time. This time, the leftmost ball will be used. Bumper pool rules get fairly simple after the start of the game. If you sink a ball, you continue with your turn. Though rare, it is possible to sink all of your balls before your opponent even gets a chance. If you can do that, your friends may have reservations playing with you again. If you do not sink one of your balls during your turn, possession goes to your opponent. This continues until a player has sunk all five of their balls. However, if you sink the fifth ball in your own pocket, you forfeit the game. Marked balls must be pocketed first. If you fail to make your marked ball before making another one, your opponent may freely sink two balls. As you painfully watch, your opponent may place any two balls by hand into the pocket. Avoid the sadness, don’t break the simplest rule of bumper pool. The same rule applies if you sink one of your balls into your own pocket. Or, if you happen to hit your ball off the table. Though it was accidental, your opponent will receive another automatic two-ball score. However, this time, your opponent may place your fallen ball anywhere on the table. Hopefully, your opponent is the heavier handed player. Jumping your balls over other balls will result in the same penalty. Basically, if you break the bumper pool rules, you are at an extreme disadvantage. Be mindful of the marked ball and play with finesse, not power. 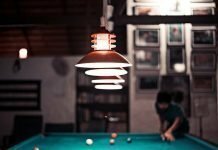 Once you learn how to play bumper pool correctly, odds are you will have fun. That’s it. Bumper pool rules are pretty simple. Finding a place to play bumper pool is hard these days. Usually you just get lucky and stumble upon a table at a dive bar. For example, if you happen to be in Chicago, you can play bumper pool at the popular dive bar Shoe’s Pub in Lincoln Park West. Whether you play at home or at the bar, enjoy this game. And refer back to this guide if you need a refresher on the rules.